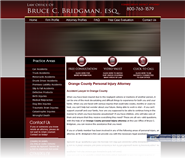 The Law Office of Bruce C. Bridgman is a personal injury law firm serving the residents of Orange County. Attorney Bruce Bridgman has been practicing law for more than 30 years since graduating as a Wilson Scholar from UCLA law school. Before he entered into private practice, he served as Los Angeles and Orange County Deputy District Attorney. With credentials like that, you can be confident that this firm offers their clients high quality legal service. All the attorneys at this firm have impressive credentials and have impressive track records of obtaining successful results for their clients. Because there are many attorneys at this firm, they are able to each specialize in a particular area of personal injury. This way, you can be guaranteed that you are being represented by an attorney who knows how best to handle your situation. Some of those practice areas include car accidents, medical malpractice, wrongful death and many more. Individualized care is this firm's specialty, and should you become a client, you can be confident that you will get the same kind of care. If you have been injured in an accident that was caused by the negligence of another, then you should seek the help of The Law Office of Bruce C. Bridgman. The negligent party should always be held accountable for their actions, so don’t hesitate to obtain legal counsel. This firm is open 24 hours a day so that there is never an inconvenient time to call and get help. They offer free consultations so that they can determine how best you can be helped in your particular case. Don’t wait another minute, if you have been injured and you want the help of an experienced personal injury attorney who cares about you as an individual, then contact this firm today.